The wind was cold, the sky grey, the rain pelted down, as we stood in front of the too-wet-to-sit-upon bleachers that had been erected along the waterfront especially for the event. We were watching and waiting for sight of one or both of our grandchildren. 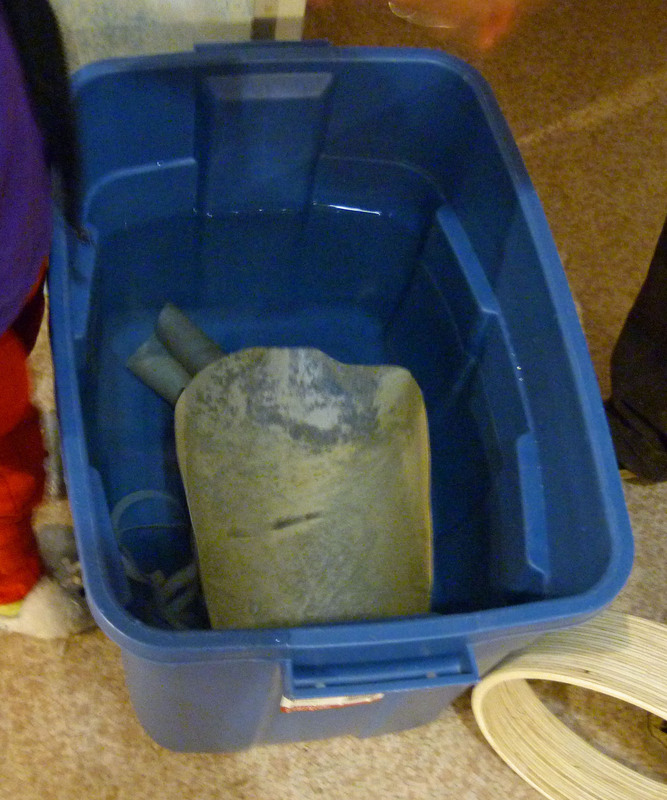 They, each accompanied by a parent, were participating in the annual Sufferfest being held in Kaslo. What is Sufferfest you might ask? To quote the website intro: “Kaslo Sufferfest is a dynamic mountain biking and trail running event in the Kootenay Region’s mountain village of Kaslo in British Columbia.” This is a two-day event that draws many participants from the Kootenay area. There are races of varying lengths and degrees of difficulty for anyone age thirteen years and up. There is also, on Saturday only, an option for kid’s ages thirteen and under to bike or run a 2.5km course departing from Vimy Park. Our five-year-old grandson is a fast and enthusiastic runner, too fast for Sarah to keep up to, so he was accompanied by his father in the eight and under running class. Sarah and her four-year-old daughter chose mountain biking in the six and under class. Children began to trickle in, and after about fifteen minutes we saw a little pink bike, carrying a very determined, blond-haired girl round the corner, mother closely in tow. She saw us standing there, I’m sure, but her eyes were on the finish line. The fact that she’d come in last did not faze her. She was proud to have just completed the task. And well she should be, considering she was the only four-year-old in the race, and she had just learned to ride a two-wheeler a month ago! Before long the runners started to appear and we soon saw the boy we were looking for come running and smiling around the corner. Our presence distracted him and we had to remind him to continue onto the finish line. He was awarded a second place “medal” (huge chocolate chip cookie on a lanyard). I think he might just make a name for himself as a runner one day. On Sunday morning we were honoured to be invited to join Sarah and Kendrick and the kids at a Drumming Circle and drum-making workshop, being held by the local Aboriginal Community at the Kaslo Youth Centre. 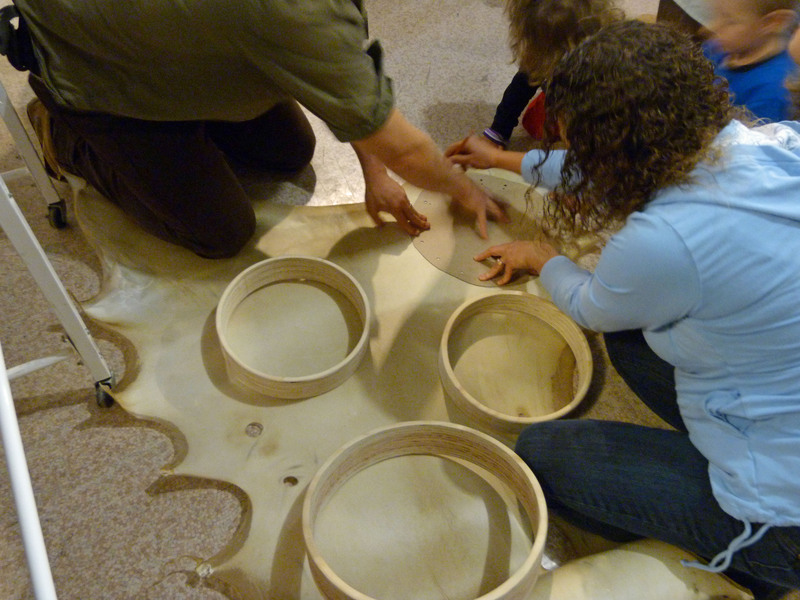 We were warmly welcomed into the Circle, invited to share lunch, and encouraged to ask questions, take pictures and lend a hand in the making of drums and sticks. 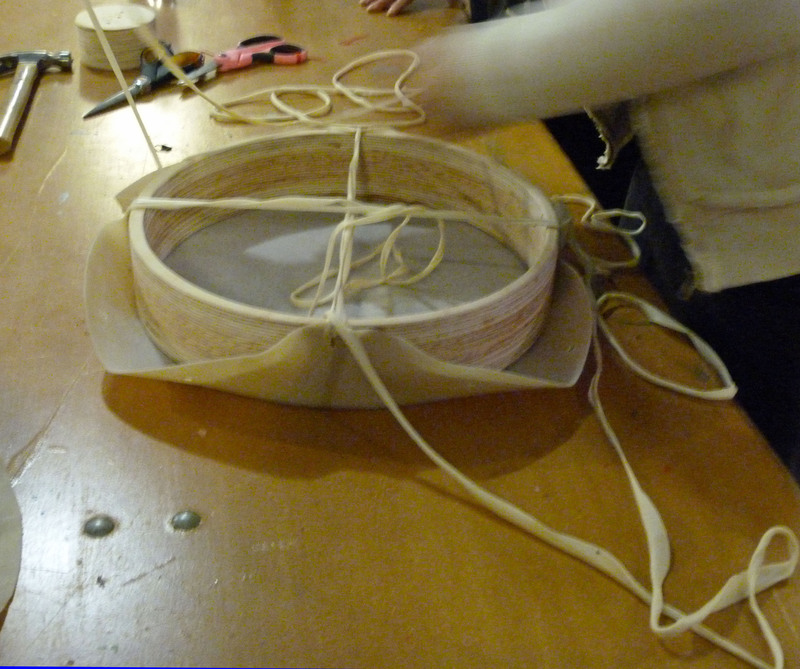 The first step to making a drum is to choose a wooden frame. 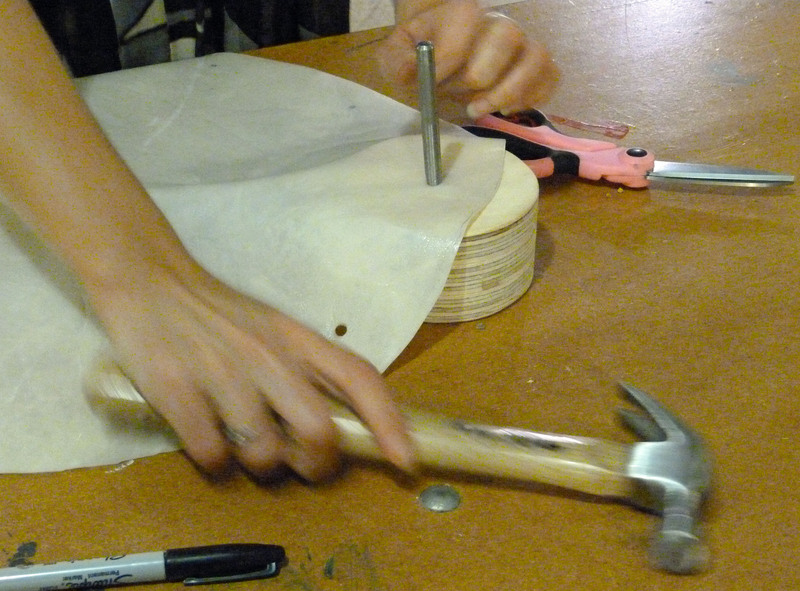 Next, a skin is chosen and circles cut from the appropriate sized patterns to fit the frames. 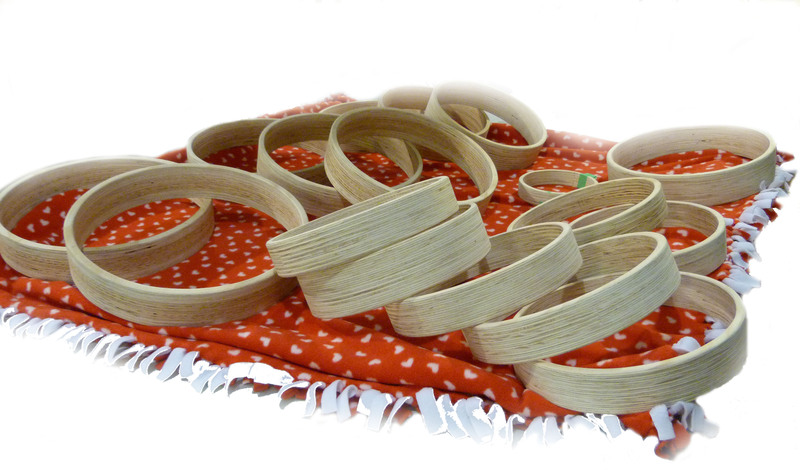 Long strips of hide are also cut for tying the drum heads onto the frames, and then they are put into warm water, along with the circles, to soak for a couple of hours until well softened and pliable. 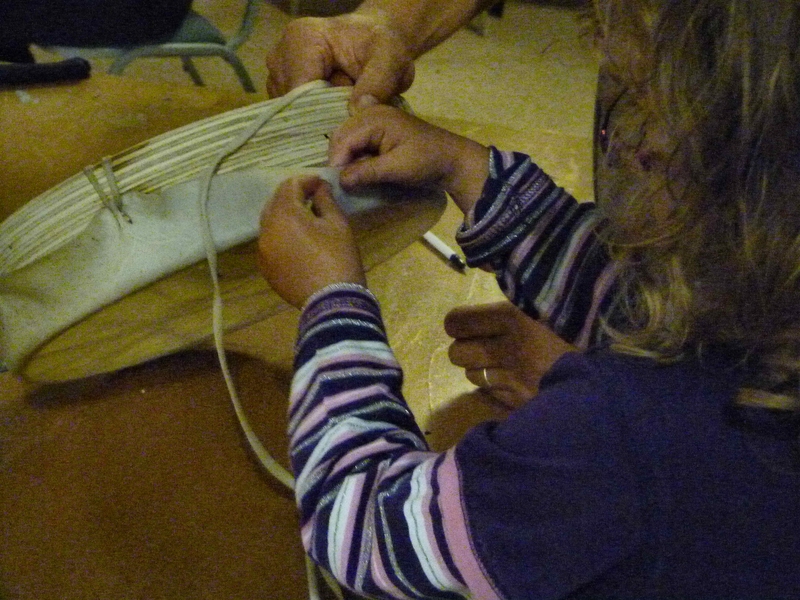 While we waited we were entertained with songs and stories in the Drumming Circle, lunch was shared and pieces of leather were cut, stuffed and sewn onto wooden dowels to make drum sticks. 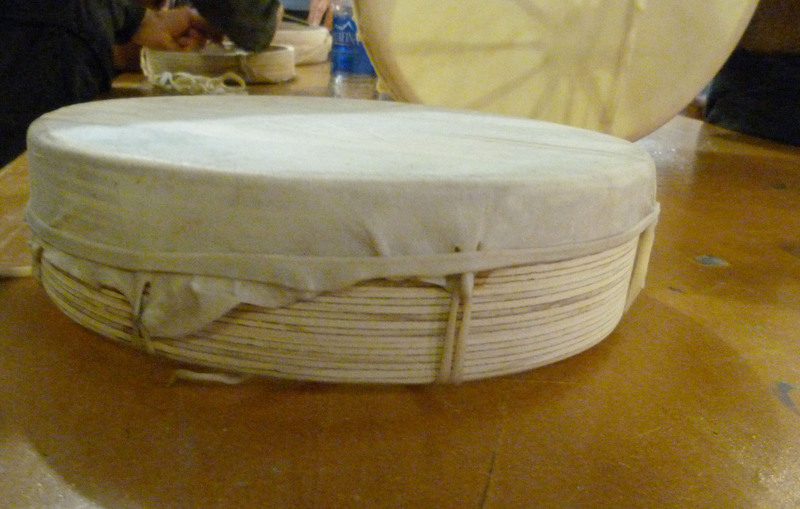 When the soaking was done, the hides were punched with holes for tying, and then stretched and tied over the frame, using the long strips of hide. There is a particular pattern to follow. 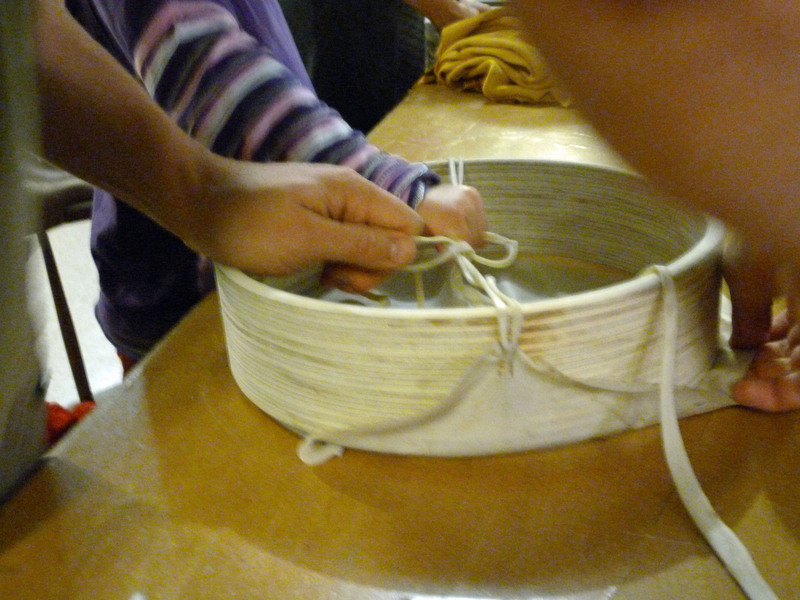 Once the series of tying is complete, a final piece of hide strip is wrapped around the outside to hold the edges down until the hide has completely dried. Sometimes the tying pattern is different, as in the one above, and often times the owner will take their new drum home to personalize it. They all sound wonderful in the drumming circle. What an interesting way to spend our last day in Kaslo. It reinforced my feelings that Kaslo is like one big, loving, sharing family. 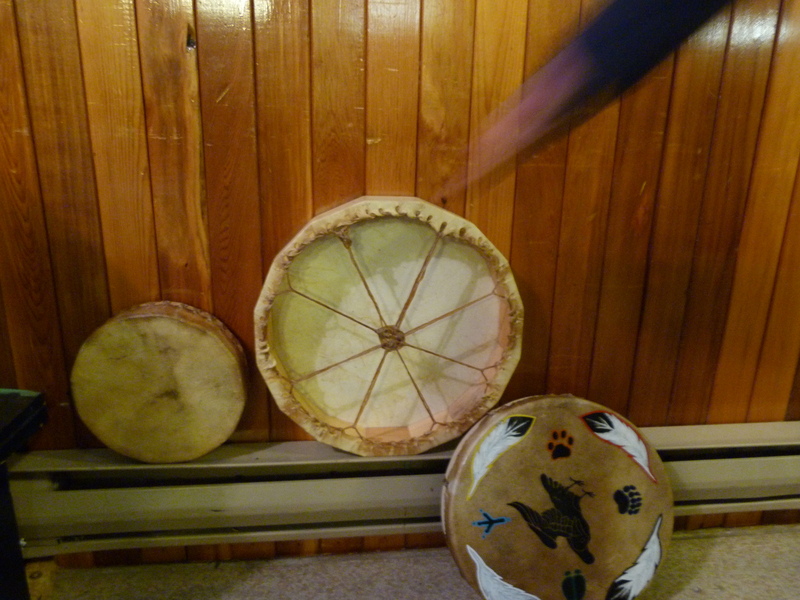 This entry was posted in Community, Food, Photography, Travel and tagged Drumming Circles, drumming workshop, family, Kaslo, Kaslo BC, Sufferfest BC, travel. Bookmark the permalink. How great for Sarah, Kendrick and the kids to participate in such a fun physical activity, and your granddaughter is totally right that it’s not where you finish that count, but that you finish upright and smiling! The drumming workshop looked amazing and what a great finale to your trip. I’m sure you will be reliving these wonderful memories for a long time. 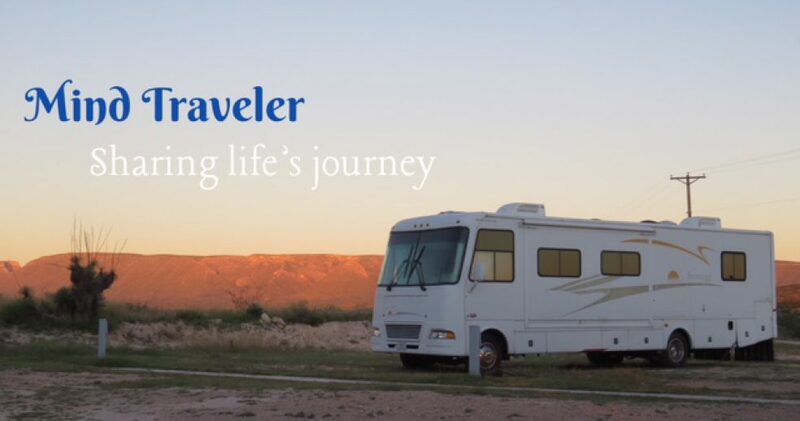 Thanks for taking us on the journey.